Incase, a company best known for its cases for laptops, iPods, and iOS devices, recently entered the audio market with a full line of headphones, focusing on the same simple, elegant design that has been the hallmark of the company. 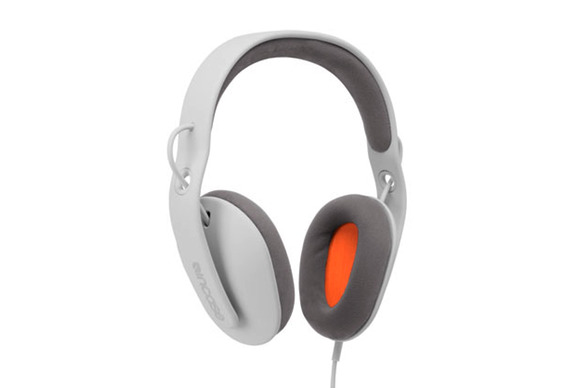 The $150 Sonic Over Ear Headphones ( ) is the big daddy of Incase’s headphone lineup. Unsurprisingly, what first stands out about the Sonic is its design. With its clean, smooth contours; soft-touch, matte finish; hidden headband adjusters; and absence of visible hinges or gimbals, the Sonic looks like an object from the future. Or, perhaps, from Cupertino. Incase offers the Sonic in four different color/trim combinations: black/green, white/gray/orange, white/black, and gray/aqua. The earpads are covered in soft, gray or black suede. The inline remote’s buttons are well-spaced and easy to identify by touch. In my testing, the microphone produced good-quality audio, though my voice sounded a bit quiet to those on the other end of phone calls. The Sonic comes with a soft case with an internal pocket for the cables and the included 1/4-inch-headphone-plug adapter. The Sonic’s plastic construction is more than a design element: It also makes for a very light and comfortable set of headphones. Some user comments around the web have expressed dissatisfaction with the noise isolation of the Sonic’s earpieces/earpads. This may be a result of the relatively soft spring of the headband—the Sonic doesn’t squeeze your head as tightly as with some other headphones I’ve tried. But for me, there’s enough pressure to keep everything in place and enough of a seal to provide adequate bass reproduction. Listening at higher sound levels may well result in unwanted sharing, but ordinary listening levels produced no audible leakage in my use. The light weight, the suede earpads, and the light headband pressure make for a comfortable headphone that can be worn for extended periods without fatigue. The Sonic also passes the “hair pull” test with flying colors—there’s nothing in the headphones’ design to snag or grab your hair. Put simply, the Sonic sounds very good. Though the very lowest frequencies are absent, and the deeper bass is not as well-defined as with higher-end ‘phones, bass reproduction is solid without overpowering the midrange frequencies. Male and female vocals sound natural and unstrained, neither buried behind the instruments nor jumping out in front of them. Treble frequencies are polite, with good detail, though midrange and high frequencies could be brought forward a bit. The soundstage is nicely spread from left to right, with instruments and voices distinct and well-defined, although you don’t get as much depth as with the best headphones. Overall, the Sonic’s audio signature is slightly warm, but not objectionably so: “Warm and balanced” is a good synopsis of the Sonic’s sound. That may not please audiophiles—especially those who love to A-B compare the Sonic with headphones costing a lot more—but it’s a nice set of compromises for most people, and the result is more enjoyable than my critical comments might make it seem. The Sonic will more than satisfy the average listener, and it might leave them wondering why this headphone is not getting glowing recommendations from more reviewers. The Sonic is not an audiophile headphone, but it’s not intended to be. Still, its sound has no glaring faults—it’s natural, balanced, and easy to listen to—and its light weight and large, soft earpads make it comfortable for long listening sessions. In addition, the Sonic’s design is distinctive, clever in its hiding of moving bits, and, yes, beautiful. At its usual street price of around $100, the Sonic is a great value, particularly if design is a high priority. At the full price of $150, you can find equal or better sound, but, depending on your personal preferences and priorities, that may not matter when stacked against the Sonic’s design and comfort.